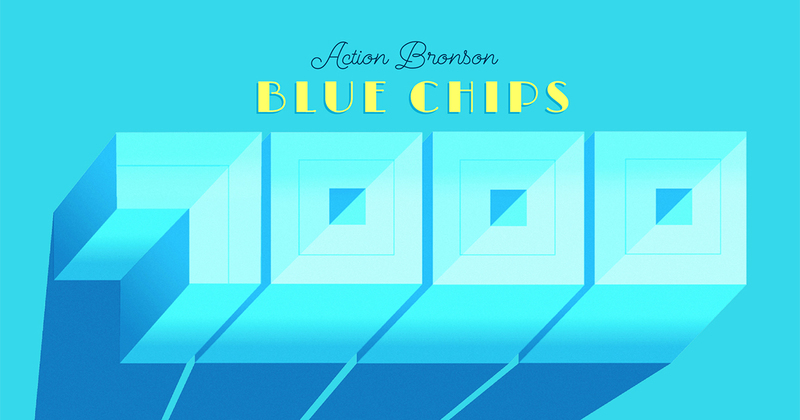 Action Bronson has put out the third installment of Blue Chips series with Blue Chips 7000. This album has a 70’s funk vibe thanks to the production efforts of some A-List producers. Bronson, who put his signature Queen’s drawl over it, delivered funny, confident lines. A former high-class chef, Bronson started rapping after he broke his leg in the kitchen. Taking notes from classic New York rappers, like Wu Tang Clan & Kool G Rap, Bronson crafted his own rapping style after leaving the kitchen. His raps are filled with things that he loves. Food references, as well as talks of fancy cars, obscure sports stars, his smoking habits and New York references can be found on any Action Bronson project. Blue Chips 7000 is no different. The production by Party Supplies brings this project together. Right off the bat is “Wolfpack”, the first song on the project; a funky, drum set based beat with funky bass lines lays a perfect valley for Bronson to disturb the peace with his relaxed but articulate flow. Songs produced by Party Supplies take the tape, but a vibe is maintained throughout the tape regardless of the producer. Longtime collaborator “The Alchemist” and Daringer have some beats on this tape that work well, too. A low point of this project is “9-24-7000”. Produced by Harry Fraud, a polished production style that does not seem to fit at all leaves the feeling that it was set earlier in the project. The song sounds like an attempt to create a club banger, but even in that realm it does not really hold up on its own. The song might be making fun of itself a little bit and may possibly just be a commentary on these type of “serious” songs made by other rappers. The song is not bad per say, but its existence on this tape is confusing, to say the least. Bronson can rap, there is no denying that. His style is attractive because it does not take itself seriously. A mainstay in Action Bronson’s rapping is the amount of comedy he brings to the table in his raps. For example, “My Right Lung” has a hook about Bronson’s dying wish to dunk a basketball: “I’d give my right lung if I could dunk a basketball just one time.” To put some context on the line, Bronson is a heavy set man with a broken leg in his history. Verdict: Bronson is not much of a technical rapper. He is not a fast rapper or a metaphorical puzzle laying rapper like peers like Kendrick Lamar or MF Doom. However, Bronson does have style and a lot of it. He knows the pace at which he thrives, and he knows what production he needs to bring a song to the next level. Thanks to the all-star cast of producers and most importantly, Action’s sense of humor and flow, Blue Chips 7000 is a highlight for Bronson.